Weaving read aloud time into the fabric of family life is often a matter of looking for opportunities, and turning them into habits. 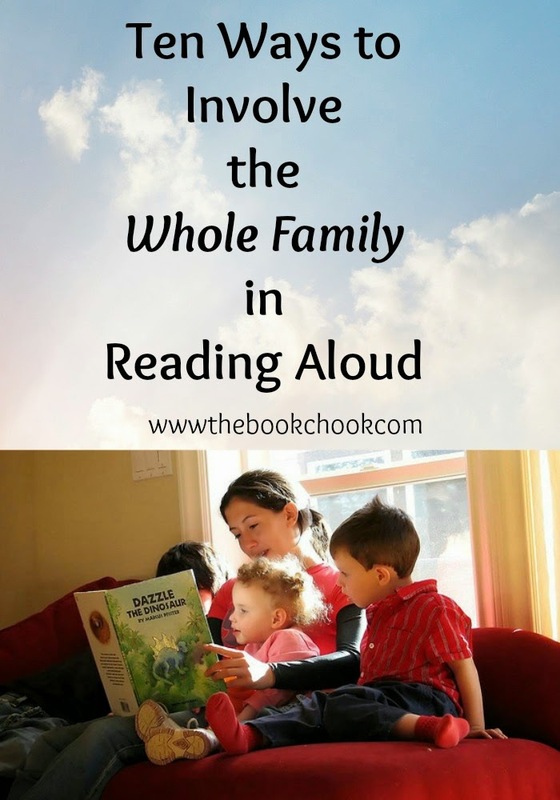 Here are some ideas for involving your whole family in reading aloud. I'd love you to add any more in the comments section below this post. 1. Read aloud at bed time. Many parents do this, in the sense that one parent reads aloud to one child. But consider making it a time for the whole family. A comfy place could be mum and dad's bed, perhaps after baths, giving everyone a quiet time to share a story, and discuss what is coming up tomorrow. 2. Take a book to read aloud on family picnics. Adults can share reading and eating! 3. Have read aloud books in the car for those times when you are waiting. There's often time to read a whole poem for kids at the traffic lights. 4. Take a favourite read-aloud book to doctor or dental appointments. I'm pretty sure your audience will grow if there are other kids waiting! 5. Ask visitors to your home if they have a favorite book to read aloud, or would like to choose one to read to you all. 6. Older kids might like to share the role of reading aloud. This works really well if you are reading a novel aloud in serial form. 7. Establish a family read aloud time. Have everyone pick something to read aloud: a passage from a book or a favourite page. Really young ones might choose a book they know by heart, or tell what they think the page says. 8. Build read aloud into the routine of your day. Choose easy times to remember eg just before, or just after dinner. Make it something to look forward to. 9. Have read aloud times at sleepovers and parties. Give books as gifts or party favours, and have kids share their favourite sections. 10. Have lots of books in your home, of different genres and types. Make sure there's a huge book pool to chose from. Consider choosing poetry to read aloud. You might also like to read Top Tips for Reading Aloud, When Should We Start Reading to Kids? and Why Reading Really is Magic.